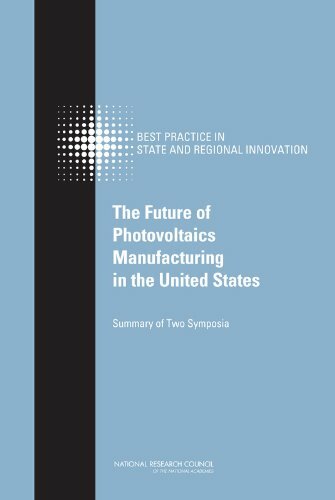 [PDF] The Future of Photovoltaic Manufacturing in the United States (Committee on Competing in the 21st Century: Best Practice in State and Regional Innovation Initiatives) | Free eBooks Download - EBOOKEE! Description: Technological innovation and growth are critical to U.S. competitiveness in a global economy. One means of facilitating growth and improving competitiveness is to foster more robust innovation ecosystems through the development of public-private partnerships, industry consortia, and other regional and national economic development initiatives. Public-private partnerships, in particular, catalyze the commercialization of state and national investments in research and development. One of the major projects of the National Research Council's Board on Science Technology and Economic Policy (STEP) is to examine state and local investment programs designed to attract and grow knowledge-based industries. STEP analyzes state and regional innovation initiatives to gain a better understanding of the challenges associated with the transition of research into products, the practices associated with successful state and regional programs, and their interaction with federal programs and private initiatives. In April and July 2009, STEP convened two meeting to assess the future of the U.S. photovoltaic industry and the practical steps that the federal government and some state and regional governments are taking to develop the capacity to manufacture photovoltaics competitively. The Future of Photovoltaic Manufacturing in the United States captures the presentations and discussions of these meetings. This report explores the prospects for cooperative R&D efforts, standards, and roadmapping efforts that could accelerate innovation and growth of a U.S. photovoltaics industry. It includes both efforts to strengthen existing industries as well as specific new technology focus areas such as nanotechnology, stem cells, and energy in order to gain an improved understanding of program goals, challenges, and accomplishments. No comments for "[PDF] The Future of Photovoltaic Manufacturing in the United States (Committee on Competing in the 21st Century: Best Practice in State and Regional Innovation Initiatives)".